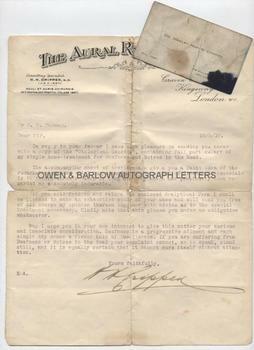 DR CRIPPEN Typed Letter Signed. Dr Hawley Harvey Crippen (commonly known simply as Dr Crippen) American murderer. The first criminal to be apprehended by means of wireless telegraphy. TLS. 1p. On his 'The Aural Remedies Co' notepaper. Craven House, Kingsway, London. W.C. 23rd May 1910. To Mr G E Duncan. With a fine, large autograph signature. Together with his printed business card. "In reply to your favour I have much pleasure in enclosing you herewith a copy of the "Otological Gazette", containing full particulars of my simple home-treatment for deafness and noises in the head. The accompanying sheet of testimonials gives you a faint idea of the remarkable success which has attended my new method of treatment, especially in severe chronic cases of long standing which had previously been regarded as absolutely incurable. If you will fill in and return the enclosed Analytical Form I shall be pleased to make an exhaustive study of your case and will send you free of all charge my opinion thereon together with advice as to the special Treatment necessary. Kindly note that this places you under no obligation whatsoever. May I urge you in your own interest to give this matter your serious and immediate consideration. Deafness is a progressive ailment and each single day means a firmer hold of the disease. If you are suffering from deafness or noises in the head your complaint cannot, so to speak, stand still, and it is equally certain that it cannot cure itself without attention. Yours faithfully, H.H. Crippen". 4to. Approx 10 x 8 inches. There have been some old tape repairs to folds on verso. The tape has, at some point, been removed, and replaced with more archivally friendly paper strips. The business card measures approx. 3.5 x 2 inches. 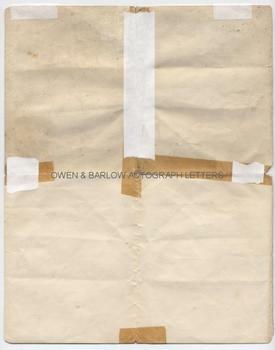 It is printed with his name, address and telephone number and is somewhat creased and soiled and is heavily ink stained in lower right corner. Dr Crippen was an American doctor who was practising in London and specialising in the sale of quack remedies. He had fallen in love with his secretary, a typist named Ethel le Neve. When his second wife, Cora Turner (a music hall singer known as Belle Elmore) discovered the affair, he murdered her on some date after 31st January 1910. After receiving requests to investigate her disappearance, the police interviewed Crippen, who fabricated a story to explain her absence. Crippen and Ethel le Neve took fright and fled to Antwerp, where they subsequently boarded a ship bound for America, with Ethel le Neve disguised as a boy. 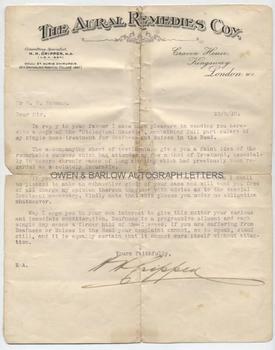 This letter (which from the typists reference 'E') was almost certainly typed by Ethel le Neve at Crippen's dictation, was written about 4 months after the disappearance of Mrs Crippen and about 2 months prior to Crippen's arrest in Canada. Following further investigation by the police, human remains were found in Crippen's cellar and following a telegraph sent to the ship's port of destination Crippen and le Neve were arrested on the ship's arrival. He thereby became the first criminal to be apprehended in this way. Crippen was tried for his wife's murder and was executed on 23rd November 1910. The case was one that attracted huge publicity and continues to be one that is frequently referenced in literature and popular culture. 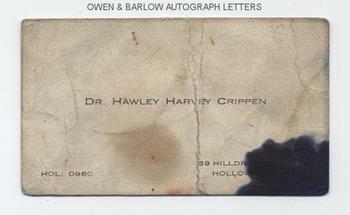 A key autograph in any crime collection, together with Crippen's business card which is a rarity.